A mounting body of evidence from this colossally sickening year suggests we are living in the end-times. For the skeptics, the willfully naive, the hopeful souls holding out for a better tomorrow, may I present the return of Crazy Frog. On YouTube, statistics like engagement over time, watch time, and audience demographics are—in most cases—only available to the uploader. Verified channels, however, often provide some basic stats to all users. Many of these channels are controlled by Vevo, the video hosting service owned by Universal Music Group, Sony Music Entertainment, and partially owned by YouTube parent Google. In short, any song you’ve ever seen on TV or heard on the radio in the past 8 years is somewhere on YouTube under Vevo’s auspices, with its views over time for all to see. Digging through some of the most egregious songs of my adolescence I noticed an alarming trend: nü metal seemed to be coming back, rising in popularity over the past year or two. Just look at these view graphs, aching ever upward to their early 2000s glory days. The pattern held true from many of the genre’s worst offenders. Chevelle, POD, Slipknot, Mudvayne, Papa Roach, and Limp Bizkit all showed significant growth lately. But that’s the trouble with a limited data set. As it turns out, people just watch more stuff on YouTube in general now—or at least that explains the familiar upward slope that greeted me on the statistics section of every Vevo page. Widespread broadband internet, reliable wifi, and YouTube’s relentless expansion into new territories—not a nostalgic return to chugging guitar riffs, Hot Topic bracelets, and a reductive view of mental health—was at play. Nearly every somewhat popular song I could think of from the early- and mid-2000s showed a similar trajectory, regardless of genre. Even the sluggish views on J.Lo’s “I’m Real” were on the climb. All except one. Since late 2015, Crazy Frog’s “Axel F”—the ringtone marketed by Jamster which improbably reached #1 on pop charts across much of Europe in 2005—saw absolutely meteoric growth. What’s going on here? What happened that cause a renewed interest in this awful, awful thing? And can we all agree to stop doing it? Update 11/4/16 11:58am EDT: A number of Gizmodo readers tweeted and emailed—many apologetically—with their hypotheses on the stunning return of Crazy Frog. Ricky Villacrez pointed to a bizarre vocaloid cover which itself was a remix of the infamous Crazy Frog Bros lip sync. A Tumblr post was proposed as a culprit by another reader. 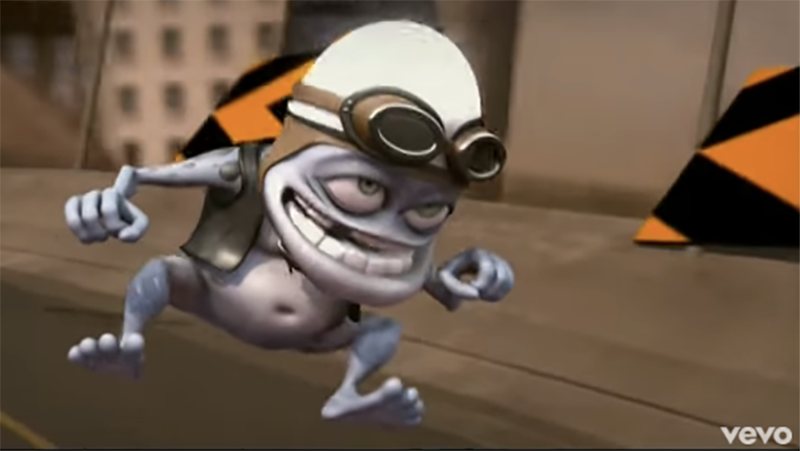 Lord Matthew squarely placed blame for Crazy Frog’s comeback on a mashup video which replaced the “ding ding” of “Axel F” with Trump’s infantile “bing bong” soundbite. One email described a school prank phenomenon of “frogging” people who left their laptops unlocked which apparently got out of hand and spread to neighboring districts. Evidence of this behavior remains hazy, though the reader responsible apologized profusely for his involvement. By far the most frequent and plausible explanation came from parents. “Axel F” is, after all, catchy, inoffensive, and the video features a friendly cartoon frog. It’s catnip for their kids—and just like so much other colorful nonsense, it apparently shows up frequently on the YouTube Kids App, which launched in late February, 2015. What explains the gap between the Kids App’s creation and Crazy Frog’s renaissance many months later remains to be seen.